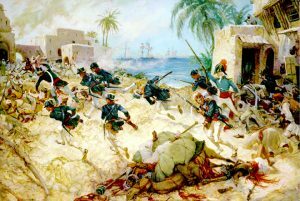 Two Hundred and Eleven years ago on April 27, 1805, the United States Marines defeated the Muslims of the Barbary States (Algiers, Morocco, Tunis, and Tripoli) in Derne, Libya, and for the first time in history the flag of the United States flew over a fortress of the old world. “From the shores of Tripoli” in the Marines Hymn is a direct reference to this battle. On 14 May 1801, the Pasha of Tripoli indicated his extreme dissatisfaction with American “tribute” by having the flagstaff cut down in front of the U.S. Consulate. This act led to a declaration of war against Tripoli and the sending of more U.S. war vessels to the Mediterranean. During a storm, the USS Philadelphia, went on the rocks and her crew was captured and imprisoned by the Muslims at Derne. The bombardment of Tripoli by U.S. vessels and the offer of $100,000 ransom for the crew of the Philadelphia failed to sway the Pasha. 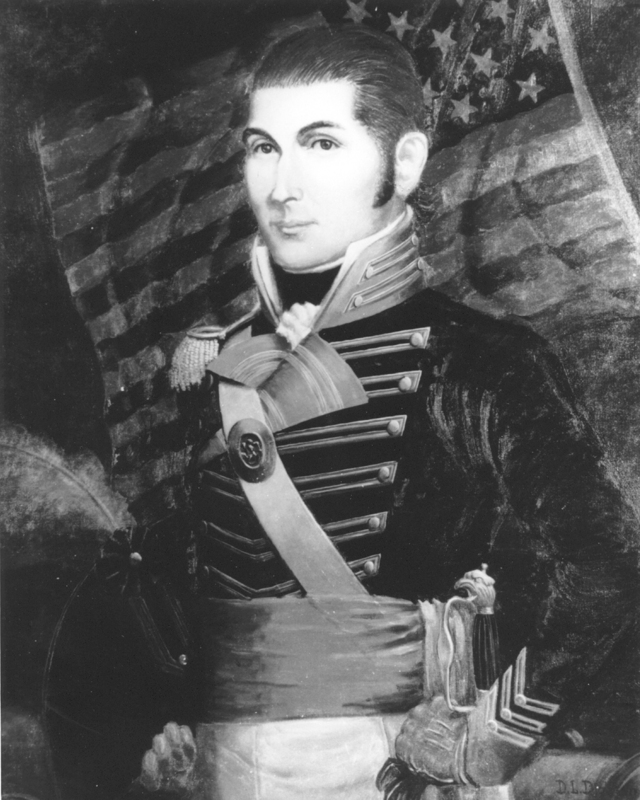 On April 27, 1805, the USS Nautilus, USS Argus and USS Hornet commenced their bombardment, and Lieutenant O’Bannon, with his Marines, a few Greeks, and as many of the cannoniers passed through a shower of enemy musketry, took possession of one of the enemy’s batteries, planted the United States flag upon its ramparts and turned the guns upon the enemy. After two hours of hand-to-hand fighting, the stronghold was occupied. The Tripolitans counterattacked the fortress a number of times, but were repulsed with heavy losses. Finally, on 28 May, Eaton’s forces launched a spirited bayonet charge which drove the enemy from the vicinity of Derne. Presley O’Bannon was presented with a jeweled sword with a Mameluke hilt by the newly installed pasha. The Mameluke swords are still carried by Marine Officers today. In the first battle and victory for the U.S. Marines and the U.S. military on foreign soil, President Thomas Jefferson and America defeated the Muslims of the Barbary States. Today, the Global Jihad continues and Derne is the headquarters for Ansar al Sharia and the place from which many Muslim martyrs depart for operations in Iraq. If only America and Marine Corps leadership had the clarity President Jefferson and hero/Marine 1st Lt Presley O’Bannon had in 1805, we might be victorious again. After his presidency, but before he was elected to Congress in 1830, John Quincy Adams wrote, “While the merciless and dissolute dogmas of the false prophet shall furnish motives to human action, there can never be peace on earth and good will towards men.” Unfortunately, we have failed to learn the lessons of history and now we are reliving them. It is amazing how much smarter we are 186 years after Adams penned those words. Brief respites in the conflict notwithstanding, from the time that Ponce de Leon landed on northeast coast of the present state of Florida in 1513, unto this very day, America has never not been at war with Islam. Unfortunately, our Commander in Chief seems to share greater esprit de corps with this enemy than with the brave men and women under his command. My (earthly) Dad proudly served our Country in the U.S. Air Force for twenty-five years. Our youngest son stills serves America active-duty Army after two combat tours in the Middle East. It is both shameful and criminal what BHO has done to our military and our Country as a whole – all the while, a complicit “all talk, and no action” Congress pretends to be concerned for our military and for our Nation’s founding Judeo/Christian values. I know that we still have millions of “good” men (and women) here and abroad, but we all need to cast away our fears and begin speaking up and speaking out! Most importantly, we need to act for righteousness and not be merely hearers…, but also doers of the Commands contained in the Christian Bible. That sure worked well for the first 200 years of America. And yes…, America (We the People) and her allies ARE at war with the adherents and activists of Islam. The enemy has entered our gates via Trojan Horse strategy and now lives amongst us. Keep fighting your good fight. However – recognize that even then this was not a serious opponent. Never mind present day. Perhaps our defenses are compromised by in effect an immunovirus that allows trifling pathogens to endanger the entire system. No other sight imaginable to the American mind so eloquently inspires the true meaning of duty, love of country, bravery and pride as do formations of United States Marines in dress blues marching past the White House in step to their magnificent hymn. As to the core issue, my answer (respecting adults) is an unequivocal “yes”. Of course America is still at war with Islam; and indeed (by default) so are each of the other populous increments comprising the 5.9 billion non-Muslims who inhabit the earth. And in spite of willful denial and/or whether one chooses to believe it or not, the other 1.6 billion, the Muslims, are at least acquiescent warmongers controlled by sharia adherent killers who seek our destruction. Simply consider the correlation between what Islam has been advocating for 1400 years and the ongoing barbarism being used to advance that diabolical agenda in the 21st century. Task-1 the United States faces though is to purge the federal government of Muslim Brotherhood operatives and other subversives while concomitantly seeking to indict & imprison (or execute) American quislings found guilty of treason. Bruce Thornton has a book Wages of Appeasement (title accurate I think), studying appeasement in ancient Greece, Europe and UK of the 1930’s, and yes Barack Obama. need to know, Thanks John, please tell us more, best regards and God Bless. The more difficult question is when did the war start? Certainly we were at war in the early 1800s. Was there ever a respite? When I think about it, I don’t believe the answer matters. We are at war today, and it really doesn’t matter how long that has been true (though if pressed I’d say the current war has been running since 1979 at least). What are we going to do about it today? THAT is what matters.